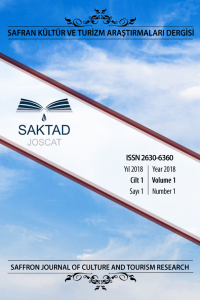 Saffron Journal of Culture and Tourism Research (JOSCAT); is an open access academic journal published by the Safranbolu Faculty of Tourism, which is an international referee focused on building theory, research and application bridges through new dynamics in the field of culture and tourism. * Tourism Area Research (Destination Planning and Management, Gastronomy, Recreation and Management, Travel Management, Tourism Management, Tourism Guidance, Destinasyon). JOSCAT is published in April, August and December as 3 (three) numbers per year. The language of publication is Turkish and English. The right to publish. Additional Issue ”Special Issue“ , "Book Reviews” , ”Translation Articles" is reserved if deemed necessary and appropriate. The article submitted to JOSCAT must not have been previously published or decided for publication. All articles submitted to JOSCAT are subject to two-stage review, including pre-evaluation and referee evaluation. The peer review process is maximum 1 (one) month. JOSCAT requires a uniform and complete page layout and publication / print format in terms of the formal integrity and readability of the articles. Material responsibility for preparing page layout belongs to the author(s). The author(s) can access JOSCAT's layout from the system. JOSCAT is committed to an approach that adopts the principles published by the Committee on Publication Ethics (COPE) benim as an open access to ethical duties and responsibilities. The scientific and legal responsibility of the articles published in JOSCAT belongs to the author(s). All rights of published articles belong to JOSCAT and may not be published, reproduced or transferred to electronic media without the permission of the editor. It cannot be quoted without reference to the published article. The editorial board is free to publish and publish the submitted letter. The published manuscript of the author(s) may be revoked in accordance with the decision of the editorial board if deemed necessary. Authors are accepted as separators, hatred and hatred. No royalty fees are paid to the author(s). According to the publication rules; "Ethics Committee Approval" must be obtained separately for the studies on clinical and experimental people and animals requiring an ethical committee decision for all disciplines. This approval should be stated and documented in the article.